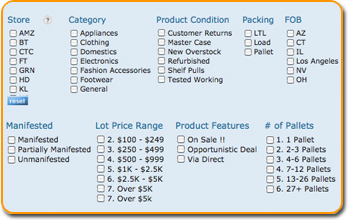 Search & Filter all our Product Types and Availabilities in one central location. Please note: You must be logged in to your account to use the Load Center. If you do not have an account, you can create one here for free. The Via Trading Load Center is a one-of-a-kind database where you can easily view all our availabilities including manifested loads from one page. 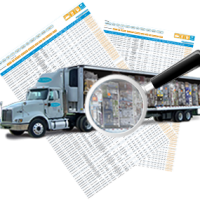 The Load Center houses all listings including assorted case packs, single pallet loads, multiple pallet loads and full truckloads of merchandise. 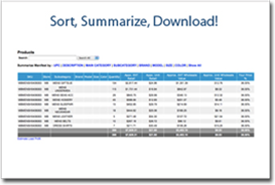 Where available, the load center displays manifests that can be viewed directly online or that can be downloaded in Excel format for your convenience. 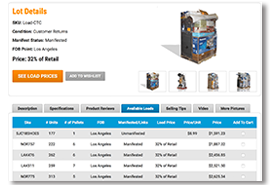 We trust that the Load Center will make your purchasing experience smoother and easier. As you navigate around the Load Center, please feel free to email us any comments, suggestions or feedback to feedback@viatrading.com. We look forward to hearing what you think! Merchandise category (electronics, clothing, etc).